This page documents the investigative steps taken in relation to the fragment PT/35(b) since its alleged discovery on 12 May 1989. The reader must understand that this is the official timeline reconstructed and wholly accepted by the SCCRC. Photo 117 of RARDE report, the first photo of the fragment, was taken on or before 22 May 89, as per photographic register (photo 117 is FC3521). 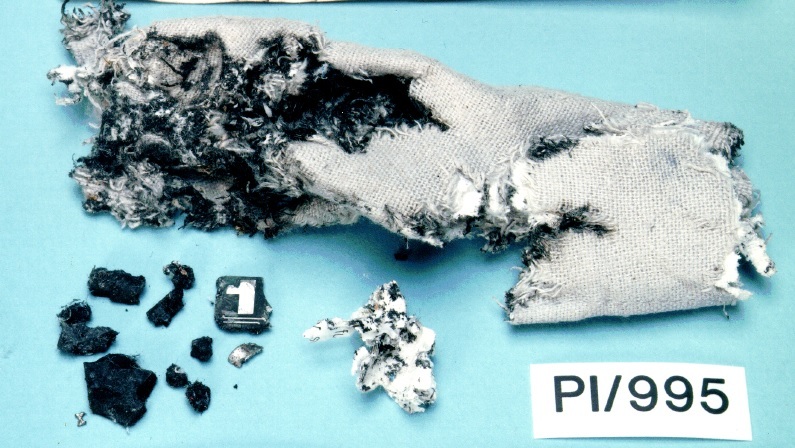 According to Feraday’s ch 10 CP, he checked the track pattern of the fragment exhaustively against his database of electronic devices used in explosions but found no match. The precise date and length of time of these enquiries is not specified. Visit by Hayes and Feraday to Lockerbie. Feraday viewed items containing circuit boards that were put aside by officers. See Fax 749 in appendix of protectively marked materials. Feraday sent the Lads and Lassies memo (prod 333, DP/137) dated 15 September 1989 to the SIO along with 4 Polaroid photos that he took himself (prod 334, DP/138). According to the SIO, Henderson’s, HOLMES statement S4710J, during September 1989 he was contacted by Feraday and informed that he had recovered PT/35(b) from PI/995 and he considered it of great significance. Following this contact, Henderson caused Williamson to liaise with Feraday and then carry out the necessary searches of the recovered property and wreckage in an effort to identify the PCB, and he was kept abreast of progress by Williamson. Photos 333 and 334 of RARDE reptort – close up photos of fragment, were taken on or before 22 Sept 89, according to the photographic register (FC3877 and FC3878). Photo 333 clearly shows the green colour on the reverse side of the fragment from the “1 ” shaped land. After the Lads and Lassies memo was sent, according to Williamson statement 872BS, a detailed search of productions was carried out to find anything that matched PT/35(b), without success. According to Feraday’s ch 10 Crown precognition, he asked the police to examine all circuit boards that had been recovered and then attended at the production store in Dumfries and examined what the police had found but could find no match for the fragment (this may relate to visit on 14 September 1989, above). See also Henderson’s statement S4710J, which confirms that he instructed Williamson to liaise with Feraday and thereafter to carry out the necessary searches of property and wreckage; the terms of the police report, section 30, which refers to an extensive search and comparison of all other items of circuit board recovered, but no other material relating to PT/35(b) being recovered; and D5609, the memo from Williamson to Ferrie referred to under the entry for 15-18 January 1990, below, which states that a full search of the property store Dexstar was carried out for any circuit board of similar description, which resulted in all items of circuit board including all cameras, radios etc. which contained circuit boards being examined but – nothing resembling the fragment was discovered. Williamson’s two ch 10 Crown precognitions give the most detail of events at this time. In his ch 10 CP dated 2711 1/99 he states that it was in the days following the receipt of the memo from Feraday that at every opportunity he searched through the productions in an effort to recover all fragments of printed circuit board, including broken cameras etc, in an effort to find a similar board. He states that he set aside a large number of items in the production room i.e. Dexstar, and Feraday then visited there and was unable to locate any boards or fragments that were similar to PT/35(b). He states that at the time the police were working from photos and were also unable to find any boards of a similar description. 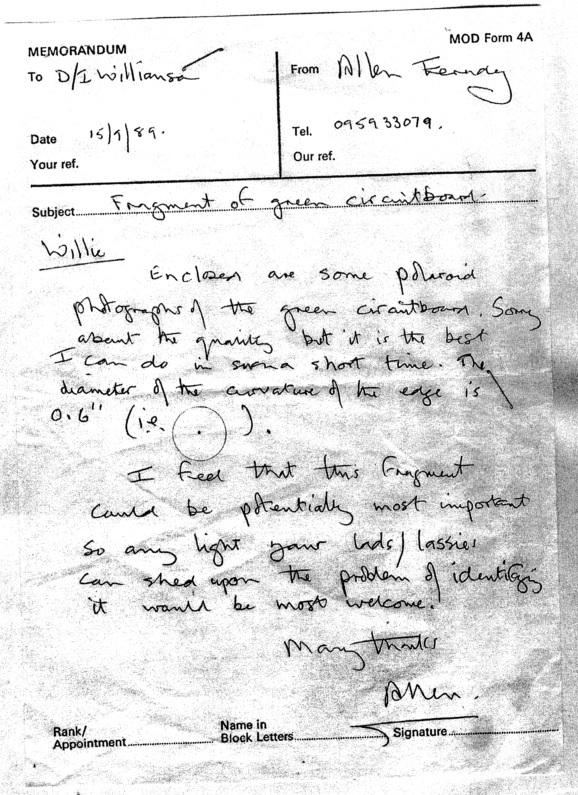 In Williamson’s ch 10 CP dated 6&7/6/00, it states that Feraday contacted Williamson and said he had identified a fragment of printed circuit board which was unusual as it had “green film” on one side, and Feraday asked Williamson to examine other recovered items to try and identify the source. This initial contact was by phone, and thereafter the memo dated 15 Sept 89 was received. Williamson states that thereafter he personally looked out any recovered items that contained circuit boards, including cameras, radios and pieces of aircraft debris, but he was not able tot find anything similar; and that he recalled that Feraday himself, during one of his visits to Lockerbie, examined a number of these items and was unable to fmd anything that matched. In his evidence Williamson stated that he informed the team of officers working at Dexstar of Feraday’s memorandum, and that it was obvious that the fragment was important, and to look out for any printed circuit board and extract any such board for Feraday’s examination. Williamson testified that as well as circuit boards, he examined items of electronic equipment – cameras, radios, walkmans, which had PCBs. He confirmed that such items might have been the property of passengers. He confirmed that Feraday came to Lockerbie to carry out these examinations but it was not possible to identify the fragment. Williamson was asked if he could recall over what time period officers in the Dexstar store were examining PCBs and electronic items. He replied that he could not recall exactly, but it was a general instruction, and that he personally withdrew a number of items of PCB himself. On the basis of fax 749 (see 14 September 89 above) it would seem that a first search for items that might match PT/35(b) took place before 15 September 89, as on 14 Sept 89 Feraday examined items looked out by the police. However, it seems apparent fiom fax 749, the lads and lassies memo and Williamson’s accounts that the search for items at Dexstar continued thereafter. Williamson’s CP goes on that in October or November 89 he was part of a team reviewing BKA reports on the Autumn Leaves enquiry and that in January 1990 he accompanied Feraday to Germany to view items recovered by the BKA in that operation. Although not stated expressly in the CP, it seems apparent that this exercise of reviewing BKA material is what led to the suggestion that Feraday examine the recovered items from the BKA operation to compare to PT/35(b). (See more under January 1990, below). Feraday replied that he had already discussed the matter with senior management at Lockerbie and saw no benefit in further discussion. McManus pressed him and referred to other potentially significant blast damaged items, and to items found in a search of Abassi’s flat in Germany, but Feraday did not agree to a visit to RARDE. There is another memo of this date from Williamson to Henderson (D5428 – see appendix to chapter 8 of the statement of reasons) re “item of interest at RARDE – circuit board”. Reference in the memo is again to PT/30, which is said to have been found in PK/2128, part of an American Tourister suitcase, at RARDE on 18 June 1989 (which would be consistent with PT/30, except it was found on 8 June, not the 18th). The memo says Feraday regarded this find as potentially most important and photos and a description of the item were supplied to the productions/property team to allow a full search at Dexstar for similar material [this sounds like it is referring to the Lads and Lassies memo]. It is stated that on 14 September 1989 Feraday visited Dexstar and examined various items there but none matched PT/30 (see fax 749), and on a number of occasions he has expressed interest in any circuitry that could be compared to PT/30. Reference is then made to items recovered from Abassi’s flat in Germany, and in particular digital alarm clocks and circuit boards, and it is suggested that these items be secured for scientific examination. Much is made in the submissions about the latter memo above, and it is submitted that originally PT/30 was unidentified, and the Lads and Lassies memo referred to it, but when PT/35(b) was reverse engineered into the chain of evidence, the memo about PT/30 was said instead to have been about PT/35(b), in order to make it look like it had been there from the start. This matter is addressed in chapter 8 of the statement of reasons. The fifth internatonal conference took place at Lockerbie. The minutes for this meeting are contained in Volume D of the application, at footnote 347. There is no specific mention of any fragment of circuit board in the minutes. A further copy of these minutes was obtained from D&G. Again, there is no mention of the circuit board fragment. operations, but no items resembling PT/35(b) were found. from a fragment of shirt material described as “PA995” (presumably another typo). Lockerbie officer should also do this. suggested that Feraday said discovering the origin would be a huge if not impossible task. sample that was contained in the clock in question bore no resemblance to PT/35(b). between the fragment and the Krups circuitry. recovered in the Autumn Leaves operation, including bomb making equipment. confirming that PT/35 did not match the circuit board in the Krups clock. for an indefinite period (see chapter 8 appendix). the HOLMES system, under the same document reference. chapter 8 of the statement of reasons. Williamson to dedicate enquiries to identification of the fragment PT/35. in the main to the physical structure of the fragment. 8 of the statement of reasons. the police decided to first select companies near Lockerbie. concentrate on identifying the manufacturer in Southern rather than Northern Europe. that he had not signed the label for DP/139, although Williamson and French had). DP/12 was the only sample removed from PT/35(b) prior to this photo being taken. 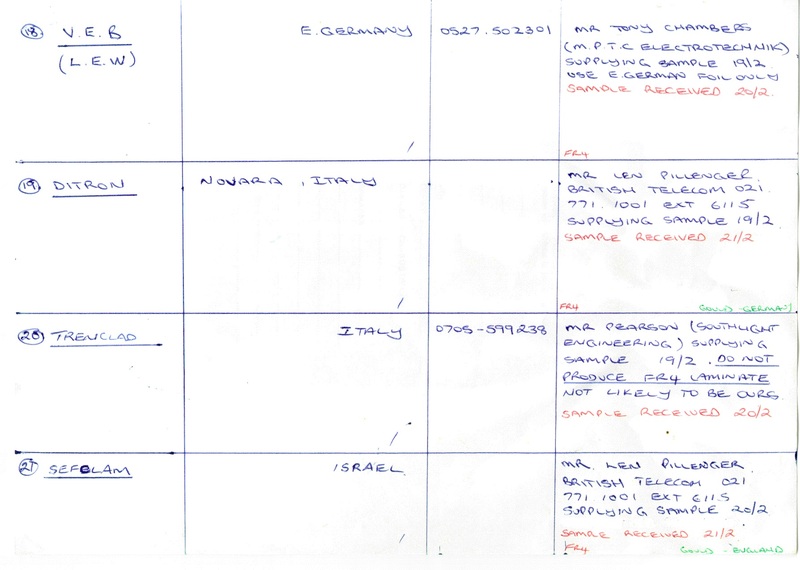 According to Williamson’s memo of 16 March 1990 to the S10 another of the “other enquiries” that was carried out was a visit to RS Components Limited, Corby, on 13 Feb 90 where the fragment was shown to unnamed members of technical and product support staff. Certain observations and suggestions were apparently put forward as to the possible identity and function of the circuit on the board but no definite information was received. There is no other information about this visit. very common. The copper tracks were plated with what appeared to be tin lead. examination of DP/11 that the copper was standard one ounce weight. must have been some time after that. Boyle’s signature in the PT/35(b) label. that time the dendritic structures in the copper produced by Gould changed. different from “around” 5 years ago. (although note the comment in his CP below). He was not asked for any more detail. sample. He said in his opinion the sample was manufactured in the Far East i.e. Whitehead concluding that the foil had been manufactured in the Far East. Whitehead’s recollection was that the copper had been manufactured in the Far East. by Robert Lomer (see 7 March 1990 below) and because of its minute size, was lost. According to Williamson’s memo of 16 March 1990 to the S10 another of the “other enquiries” that was carried out was that contact was made with Roy Hollaway of DuPont, UK (Solder Masks) on 16 Feb 90, who advised that they had no proper lab facilities in the UK but gave some information and advice. There is no HOLMES statement for Mr Holloway and the Commission has seen no other information about this visit. According to Williamson’s memo of 16 March 1990 to the S10 another of the “other enquiries” that was carried out was that contact was made with Mike Gower at the British Standards Institute but he was unable to assist in the enquiries. There is no HOLMES statement for Mr Gower. suggestions. See document D8924 in appendix of protectively marked materials. undertaken in relation to PT35 having been at an earlier briefing on 28.2.90”. Presumably this in fact relates to the meeting on 20-23 Feb 90.
copper conducting tracks and land on the fragment. of where wire was embedded in the solder. by all the experts they visited as being the most interesting feature, as it was unusual. points, which showed the tin varied in depth from 1.41 microns to 4.57 microns. the UK who continue to use pure tin in the way that it had been applied to PT/35(b). Again, there are no further details about these enquiries in the memo. anything that would specifically indicate it was involved in an explosion e.g. solder, uncovering the copper below. visible on the label for PT/35(b). According to Williamson’s memo of 16 March 1990 to the SIO another of the “other enquiries” that was carried out was a visit to Prestwick Circuits, Ayr (PCB manufacturers) on 6 March 1990. Excellent co-operation and advice was apparently received during discussions with senior management and technicians, and their conclusions were that the board had been professionally manufactured but not to a high standard and using dated technology. They suggested the best line of enquiry to be that the tin which was used as an etch resist (i.e. that coated the circuit board tracks) was uncommon as was the 9 layers of glass cloth, so these were the best avenues to pursue. Harrower’s defence precognition demonstrates that he did not have a good memory of the various places that he visited when enquiring into the source of the fragment. However, he did mention that Prestwick Circuits rang a bell. could find no trace of copper there, so concluded that it must have become detached and was lost. fragment. He therefore could not confirm whether Gould had made it. At Crown precognition, while he was able to say that he removed the further sample, DP/15, from the fragment, he could no longer remember why it was that he had been unable to reach a conclusion fiom the sample. He stated in the CP that he recalled explaining the difficulty to the police at the time, and that he had no reason to believe the police statement created thereafter was inaccurate. There is a note at the foot of the precognition stating that the manuscript statement would be necessary, followed by handwriting stating “not available”. There is no defence precognition for him. copper, that he thought it was made in the Far East – see under 15 Feb 90 above). was in all probability produced by Gould. manufactured by Gould was no more than of interest. 1992. There is no mention of him having signed DP/15 “late”. samples of the various laminates they produced for comparison with PT/35(b). produced DP/143 (prod 337), a schedule showing the laminate samples and suppliers. provided were valuable in comparison at the tests carried out at Ciba Geigy. In French’s CP he basically confirmed this account of events, but stated that he had not seen the schedule of samples, DP/143, before. He also said he tested the fragment PT/35(b) again on this second visit by police, and he said a clearer printout was achieved on this occasion. He noted from the spectra printout DP/18 that solder mask traces were found on the non-track side of the fragment. copy of the letter at his Crown precognition. Ditron and Sefolam were the closest matches, this could in no way be viewed as conclusive. obtained after analysis on an infrared spectrometer. and, once on, it could not be discerned who manufactured the solder mask. Two part epoxy solder mask was the most common. Linsdell also microscopically examined PT/35(b) and DP/11 and concluded that, on the opposite side from the copper tracks, there was evidence of copper having been scraped away, indicating that originally the board had been double-sided (i.e. copper tracks on both sides) and that solder mask had been applied to the side of the fragment without the copper tracks on it. Rawlings’ defence precognition gives more details about the tests carried out. signed the label for DP/16. base substrate widely available in the circuit board market. PT/35(b) was made of fibreglass laminate, so though closely involved with the debris from the RCR, it was not part of the RCR. That conclusion is also clear from various other sources e.g. RARDE report. expert analyst and he was not qualified to speak to the analysis carried out on DP/16. Rawlings gave evidence, Linsdell did not. convention at the SECC (below). on the label for PT/35(b). all are imported from abroad. The date of contact with the clock manufacturers is not specified, but it must have been prior to the writing of the memo on 16 March 1990.
occurred after this date (see below). The memo also mentions that Dr Colin Lea at the National Physics Laboratory was interviewed and allowed to examine the fragment and he doubted that identification would be achieved via chemical analysis. His suggestion was that a photo and detailed description of the fragment be published in PCB inhouse journals and that to generate interest reference should be made to the Lockerbie disaster. There is no HOLMES statement for Dr Lea, nor any other information to indicate that this was course of action was followed, although no doubt the enquiries were confidential at that stage. It is not specified when Dr Lea was interviewed. was clearly added to thereafter. No samples removed, but DP/11 re-potted. lead, the police went to Siemens, Munich (see below). mask on the reverse side as it is normally used for protecting tracking and circuitry. on one side of the fragment. return visit to New England Laminates. on the label for DP/11 and for PT/35(b). and tin/lead to the land, and whether the fragment was solder masked on both sides. acknowledged in his ch 10 CP had been completed by him). was alone, he thought the Scottish officers were in a meeting room with Brosamle. they might go to conduct further enquiries. had been removed from the fragment of timer. On this date KOK Tepp wrote a report (see submissions to the Commission) referring to a conversation with Gordon Ferrie on 9 May 90, in which Ferrie said they would not have to come back to Siemens in Munich as they could have the same examination done in the UK for less expenditure. The fact that Tepp was seeking this information seems to confirm he was involved in the Siemens enquiries. Ferrie also said that so far no indication of manufacturer had shown up, and no information could be found on the original purpose for the use of this circuit board e.g. component of clock, radio etc. the number of the film was cross-referenced to a number on the booklet of photos. of the booklet does not seem sigmiicant. with the interviews of MEBO personnel in Switzerland in November 1990). of the MEBO personnel and was then returned by him. the reason for application of a coating of tin to the copper conducting tracks. 13 circuit boards, stated that the tracking was to be in tin, he did not mention lead. carbons on the Sefolam, which could have been washed off PT/35(b) by the heptane. suggested they would have been in an A5 envelope. signatures are visible on the labels for DP/31 and PT/35(b). (7) the etch profile on the copper pad and tracks suggested it could be home-made, but the machined radius of the board suggested commercial machining operation. These conclusions were also listed in DC11674 (prod 357), a letter to Williamson from Worroll dated 24 May 1990, which has attached to it handwritten notes of Worroll. In Williamson’s ch10 CP dated 1711/99 he stated that Worroll’s view as that the fragment had solder mask on both sides, but that none of the other scientists who carried out such analysis agreed with him. As stated elsewhere, in his own CP Worroll said there was only solder mask on the reverse of the board. notes do not add anything to the above either. The only point to note is that in his introduction to these enquiries (prod 1765, p74), it suggests that the fragment of circuit board had been found in PI/995 by Allen Feraday at RARDE. It was of course Dr Hayes who was recorded as having found the fragment. The notebooks do also mention enquiries L-J made about the MST-13 timer on 14 and 15 August 1990 (see under the relevant date, below) and re Senegal and the interview of Jean Collin. March 1992, as arranged by Buwert (S4949U). According to Williamson’s HOLMES statement, some time after his last meeting with Worroll, he produced a “prepared descriptive report”, designated DP/141. A copy of this report was obtained from D&G. It basically just repeats the 7 points listed by Worroll (see 24 May 1990 above) plus a couple of the other characteristics of the fragment mentioned by other experts. According to the label attached to the report, it was prepared on 25 May 1990. Dr Johnston provided his analysis report, DP/36, based on his secondary ion mass spectrometry – see under 23 May 1990, above. In his DP Henderson states that he agreed to provide a copy of photograph of the printed circuit board to the American Intelligence Service but stated that he was not prepared to hand over the item. He also provided British Intelligence with a copy of the photograph of the PCB. He does not state when he did this. Americans had which eventually became K-l.
Further details about the handing over of a photograph of PT/35(b) to the American authorities are addressed in chapter 8 of the statement of reasons. could not remember why he had examined it there or if he noted anything new. non-track side, yet he saw nothing wrong with the terms of DP/141. and also consulted were suppliers of electronic kits for “do it yourself” manufacturers. the identification of the manufacturer. which did not require through hole plating even if the board was double sided. The last area of inconsistency relates to the coating on the conducting tracks. suggest the two were not the same, this issue does not appear significant.